Spanish dances boast a wide variety of styles, from Flamenco to Ballet. Whichever style you choose to enjoy, you will be taking part in an impressive culture of artistic expression that is celebrated all over the world. Spanish dances do not commit to a single genre as many other styles do. 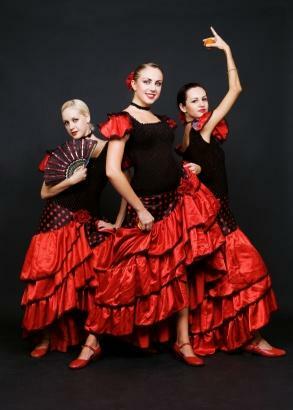 In fact, many argue there are six official types of Spanish dancing, and all are alive and well either through formal dance studios or traditional families with their roots still firmly planted in Spain. Below are the six recognized forms of movement found in Spanish dance, as well as a brief explanation of each. When you hear the term "Spanish dance", chances are you will visualize a stunning Flamenco dancer. This dance is the most popular of the six, and it is strongly in demand by those who wish to learn a local cultural artform. With its vigorous movement and infamous foot stomping, almost everyone has experienced Flamenco either through a live performance or television broadcast. Dancers play castanets and celebrate dance as they are accompanied by some of Spain's most cherished composers. Classical music provides a dramatic style and performers typically wear either ballet slippers or Spanish dance shoes found in specialty stores all over Spain and abroad. Folklore dances continue to tell tales of generations long past. Each distinct region of Spain contains different stories, which has led to varying choreography all over the nation. Diversity is celebrated in each area, and a tourist can easily learn much about Spain's past by paying attention to the various stories spun through each presented movement. These are short dances that are fused together with classical ballet. In perfect alignment with its name, Eighteenth Century Dance draws most of its movement out of choreography first written during the 18th century. Like most any nation, Spain hosts plenty of students and accomplished dancers in the genre of classical ballet. Many performers consider ballet to be the basis of all other dance forms, and is necessary before other styles such as Flamenco and Jazz can be learned. Many Spanish dancing schools that teach cultural choreography also host a wide variety of ballet classes for all skill levels. Ballet is, and continues to be, the foundation of the dance world. While not a dance style in itself, many Spanish dance masters consider the castanets to be its own dance form. This is because extensive rehearsal and study is put into the life of a castanet player, and without this creative form of percussion, much of cultural dance's intrigue would be lost. The ultimate in artistic expression is found in the simultaneous execution of both the castanets and dance steps. Spanish dances are no longer limited to Spain, and many of them are not even restricted to their own ideals. Modern companies such as the Alborada Spanish Dance Theatre in New Jersey presents various Spanish dance shows that also feature other styles of choreography such as Irish Step Dance. Alborada started in 1965 and continues to celebrate Spanish dance in a unique and fun way. Company dancers perform at schools, libraries, summer events and at regularly scheduled outreach programs for senior citizens and disadvantaged children. They also perform 5-8 live theatre productions each year. There are countless companies and studios similar to Alborada all over the United States, and Spanish dancing schools thrive in other nations abroad. The impressive cultural movements of the Spain's people continue to endure all over the world, and are often noted in world history classes and other avenues in which diversity is celebrated.